The US National Library of Medicine (NLM) and the Latin American and Caribbean Center on Health Sciences Information, of the Pan American Health Organization/World Health Organization (BIREME/PAHO/WHO) have maintained an institutional relationship of cooperation for over 50 years, sustained in favor of access and dissemination of scientific health information in Latin America and the Caribbean. The cooperation is based on lines of action for treatment, dissemination and communication of scientific health information generated in the countries of the Region, through services of access to documents; availability of the MEDLINE database in the VHL collection; indexation of Latin American journals for MEDLINE; development of the DeCS (Health Sciences Descriptors), Portuguese and Spanish vocabulary through the translation and extension of MeSH (Medical Subject Headings); and support for executing scientific information congresses such as the Regional Congress on Health Sciences Information (CRICS). 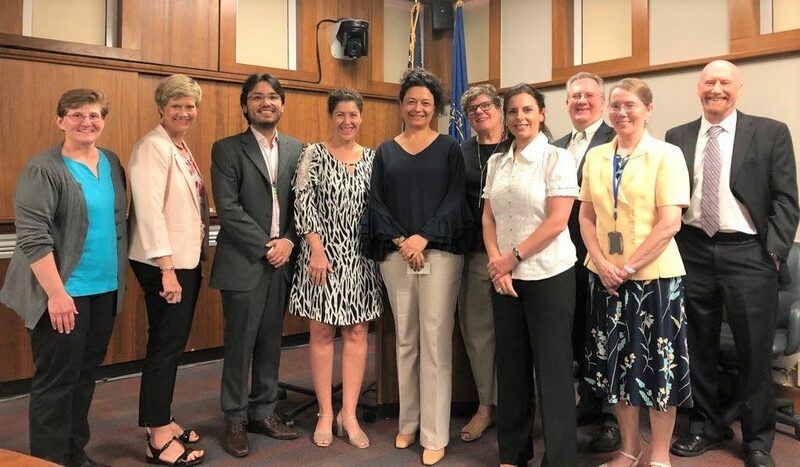 On July 11, BIREME’s management team, represented by Carmen Verônica M. Abdala (Manager of Information Sources), Renato T. Murasaki (Manager of Information Technologies) and Silvia de Valentin (Administrative Manager), visited the NLM/NIH in Bethesda, M.D., United States. The visit had been previously coordinated with Dr. Dianne Babsky, Interim Associate Director for Library Operations and former member of BIREME’s Scientific Committee. Dr. Babsky was responsible for defining the program (joint to this article), as well as for convoking the participants, among which was Dr. Patricia Flatley Brennan, Director of the NLM/NIH. Participation of the NLM/NIH in the 10th edition of the CRICS, which will take place on December 4-6 in São Paulo, Brazil. In fact, “the visit was an opportunity to strengthen cooperation between the institutions and to identify opportunities for new lines of cooperation, such as the integration of MedlinePlus to the VHL, the expansion of the MeSH with the inclusion of new terms and/or the reorganization of hierarchical structures from analyses and studies that BIREME has been undertaking with terminology for specific areas and technological transfers, starting with the area of automatic indexing”, stated BIREME’s managers. At the end of the meeting, Ms. Tara Mowery, Chief of Visiting Operations of the NLM/NIH, coordinated a tour of the NLM/NIH premises in order to show the places where a few collections of DocLine system journals are available and to explain the conservation and maintenance process for a variety of collections. From a room for data servers, it was possible to observe, on the screen, daily information referring to the main topics of interest and access by NLM/NIH users. The meeting and discussions had positive results for strengthening the institutional relation between BIREME and the NLM/NIH, in favor of access and dissemination of scientific health information in the Region, through the development of lines of action and innovative products and services. When it was established, in 1967, BIREME received support from three important institutions: the Pan American Health Organization (PAHO), the Pan American Federation of Medical School and Faculty Associations (FEPAFEM) and the NLM. This initial support was based on studies carried out by the NLM in the beginning of the ‘60s that indicated that 52% of all requests for copies of articles from scientific journals were coming from Latin American countries. This theme was the focus of the initial negotiations between the NLM, FEPAFEM and PAHO for endowing a library to serve the Region. In 1967, this was carried out when BIREME was named a MEDLARS Center with the specific objectives of training health professionals to search databases, access articles from scientific journals and index Latin American journals for the MEDLINE database. This relationship, initiated with the establishment of BIREME, has carried on through the past decades and has been strengthened by expanding the scope of technical cooperation and by developing specific projects.